Where you can dance like no-one is watching! 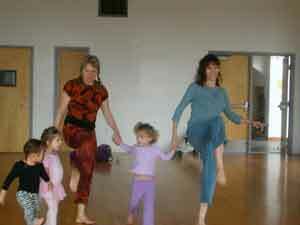 Boogie Mama's is a creative dance class for parents or caregivers to enjoy moving together with their children. Free-dance to groovy world tunes, visit the farm, or ride a train. There's structure but no emphasis on technique! 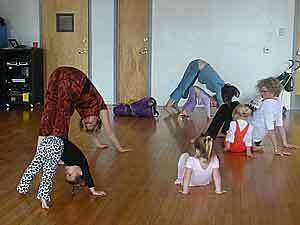 It's a chance for toddlers to explore the world of dance in creative confidence-building environment. In a recent study on teaching music to babies it was discovered that the simultaneous experience of listening and moving to a rhythm wires the brain so that the different senses work together. Phillips Silver said "for the first time we are able to show that this experience not only (positively) affects their emotional state but also influences infants sensory development." Mommy and Me - Whee! Boogie Mama's is held at The Electric lodge every Friday from 11:15 til noon. The Electric Lodge is located at 1416 Electric Avenue in Venice, parents should contact Catherine (310) 428 7308 for further details. Catherine also teaches private classes to smaller groups in the comfort of their home or venue of their choosing. Catherine also hosts Dance Parties! The Off Their Jingle Bell Rockers"